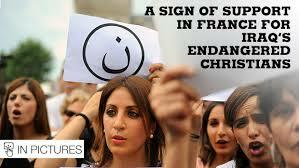 I clicked on the video link: “Iraqi Christians Persecuted”. As the three-minute tragic story ends, a legit imate tear appears in my eye. I think, “so sad”, but don’t even utter those words aloud, as I slowly shake my head. And then I clicked another link. I opted for a 2:14 feel-good video. I have gotten into the habit of watching one or two or, if time permits, three short videos a day. It has become part of my personal entertainment grid that I have added to checking email, Instagram, Facebook and, well, whatever. Somehow, though, the Iraqi Christians getting beheaded got lost in that grid. Until God. Until God put this article in front of me last night after I played with my Pinterest and before I clicked on my Kindle app. It was short, well written and even had the accompanying 3:55 audio to keep my brain in focus. It insulted me, calling out MY obvious indifference. IT called ME obscene. No, it screamed to me: YOU ARE OBSCENE. I have never had one of my links condemn me. The article was the last thing on my mind last night as I toss and turned and finally, and comfortably, fell asleep. Then, it was the first thing on my mind this morning. So, this morning, I re-read the article. And re-read it again. And then, once again. It’s true. I am one of the obscene. I had read and heard the word ISIS MANY times recently. But, I confess that I haven’t known (nor did I care enough to find out) what that acronym stands for. I had surmised that ISIS is the BAD GUYS. The Islamic State in Iraq and Syria (ISIS) is not a loose coalition of jihadist groups, but a real military force that has managed to take over much of Iraq with a successful business model that rivals its coldblooded spearhead of death. It uses money from banks and gold shops it has captured, along with control of oil resources and old-fashioned extortion, to finance its killing machine, making it perhaps the wealthiest Islamist terrorist group in the world. But where it truly excels is in its carnage, rivaling the death orgies of the Middle Ages. 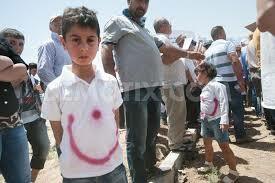 It has ruthlessly targeted Shiites, Kurds and Christians. I also learned that this is taking place in NINEVAH….yeah, remember when Jonah preached and the people repented and turned to God? Yeah, it’s their great, great, great, (etc) grandchildren. Their families are the ones that are being raped, beheaded and massacred. 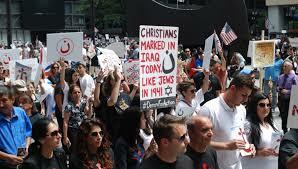 Their descendants are being driven from the very place that Jonah preached THOUSANDS of years ago. This is not a one time, isolated event. It is going on while I am checking Facebook and pinning on Pinterest. I have attempted to imagine that kind of fear–that type of aggression–in my town, my neighborhood, my street. What would it look like for them to drive their jeep into my driveway…? Our American borders mean nothing to them. I know this now–I am, finally, becoming informed. We are part of their several-thousand-year-old-plan. When I say “we”, I mean those of us that won’t renounce our Christian or Jewish faith…well, basically any faith that is not theirs. This isn’t a trend. This is not a Youtube video that stops when the 3:55 is over. My indifference has been obscene. Truly, all (ok, most) of us WANT to DO SOMETHING. That has been proven by the recent ALS challenge. We are ready and willing to pour a cold bucket of water over our heads, post the video AND even write the check. We are also eager…. 1. Think. What do I have at my fingertips? Where is my influence? When I lived in Montgomery, I had a LOT of influence, but now that I live in Georgia, I have almost nill. But when I THOUGHT ABOUT IT, I realized that I blog. As a fairly new blogger, I have 72 subscribers, and if only 25% of those read it, than I have influenced a handful of people to possibly not be obscene! That is progress. Who do you influence even in small, seemingly insignificant ways? 2. Ask God. Yes, ask God what YOU can do. He speaks to those that have ears to hear: i.e., Jonah. We all Google everyday, all day. And we Google what we want to Google. Then, Google ISIS. 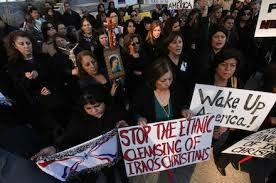 Google Persecuted Iraqi Christians. This is not for the faint of heart. Nor is it for the obscene. Also, watch the videos–they are horrible but watch them anyway. Then, think again. And ask God again what your role is in this. 4. Become less obscene. It really is a choice. Wow. I am obscene, too. Will work on those four objectives you listed for becoming less obscene. Powerful message here. Robbie…thanks for reading and for sharing and for the update on your mom and the kids! Bless you! I struggled and wrestled with myself over this same very issue on Saturday. 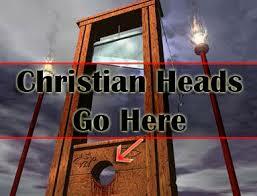 I am obscene, living in luxury (truly), while Christians are being killed, raped, beheaded, jailed, and well, persecuted. It sickens me. And you’re right–our borders means nothing. So I’m left with the same question–what can I DO? I asked God what can I DO? I looked at Jojo, asking him what we can do here and now. Nothing has come to me yet, but I still ask Him, every day, and will continue. I will also ask others. I can not ignore this any longer. God is waking us up…we have to! His kingdom begins with the small things…so the LEAST thing we do in obedience is BIG. thanks for reading. Thanks for responding! Wow, what a wake up call! This has been on my mind… I think it is now finally moving to my heart. WOW, Shawn! Thanks for writing that! One step forward is better than burying our heads…thanks for reading! Thanks for those powerful words! This is all grass roots…but isn’t that the kingdom….? This subject has been so heavy on my heart for weeks. I have watched documentaries of Holocaust survivors who recount having a normal life full of joy and within a matter of weeks that being shattered. I have dreams of this happening, in a matter of weeks men with guns marching through our neighborhoods, snatching my beloved children out of my arms. While this may be my nightmare it is a reality across the globe. My heart has a sense of urgency to educate my children but also hesitates to preserve their innocence. Lord please come back soon, but help my hands to not be idle while I wait. Ashley, thanks for writing and for bearing your soul…GOD is waking us up..we must continue to BELIEVE Him…is the their/our advocate, protector, rescuer! We have to pray those prayers! i love and miss you! I’ve ask God what I can do. Praying for ears that hear and a mind that is obedient. Love and miss seeing you…you may have left MGM, but your influence is still vibrant. Charlotte, You are most kind! Thanks. i am thrilled about the response of the blog…and thrilled at what God is doing in my heart about this. he is continuing to be faithful at showing me my next step. I love ya dearly…and miss you too! Praying for direction…I can’t watch…I can’t think about it. But I have to, they are living it. We need to do something…anything. Thanks for the clarity. Thanks for your informative post. Unlike most millions of American’s we don’t have cable or any news channels. We read our preschool books, sing Bible songs and play in the yard. We live in our protective little bubble and occasionally I hear about a major even through my family, like the plane that crashed into the ocean. As far as terrorist activities I hardly know anything and ISIS was “is” “is” me until its was mentioned at FBO last week and I looked at Ralph and asked….what are they saying…. honestly, I just think of it all as sad and “over there”. But I will think and ponder on this…thank you for informing me! Love You! Anna, thank you for your honesty…that truly is a small snapshot of most of us…no ill intent, jsut doing life with what is in front of us! Thanks, also, for pondering it! I “know” that this is going on, but digging deeper makes my “American heart hurt” so I stop myself…why is that? why do we, the privileged, turn our heads and hearts away from those in pain, persecution, and hurting? great words of wisdom Karen, as always, and thank you for sharing. Just yesterday I got an urgent prayer request from a friend who received an e-mail from a man in Iraq pleading that we all pray Psalm 91as children are being systamaticly be headed & that ISIS is closing in on his area & he will not leave. He said to pray the prayer before passing it on to others , which I did crying as I haven’t since our son was killed in 2013.
country as our fellow Christians are being massacred. Thank you, Karen, for sharing this. Karen, I am glad to know that my “mentor” 🙂 is human too. 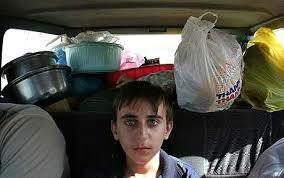 This kind of horror is something that we want to keep 1,000’s of miles away from our families and from our minds. I fear though that in line with prophecy these kinds of atrocities (although I pray not as horrific as what we are seeing) will reach our shores. Our country has turned its back on God and He has bestowed much grace upon us. My prayer is that He doesn’t hasten His return and that we spread His word and the message of His salvation in the meantime. I’ve had these times and His people, our people, on my heart for months now. I just don’t know how much worse it can get. Love you so cuz!